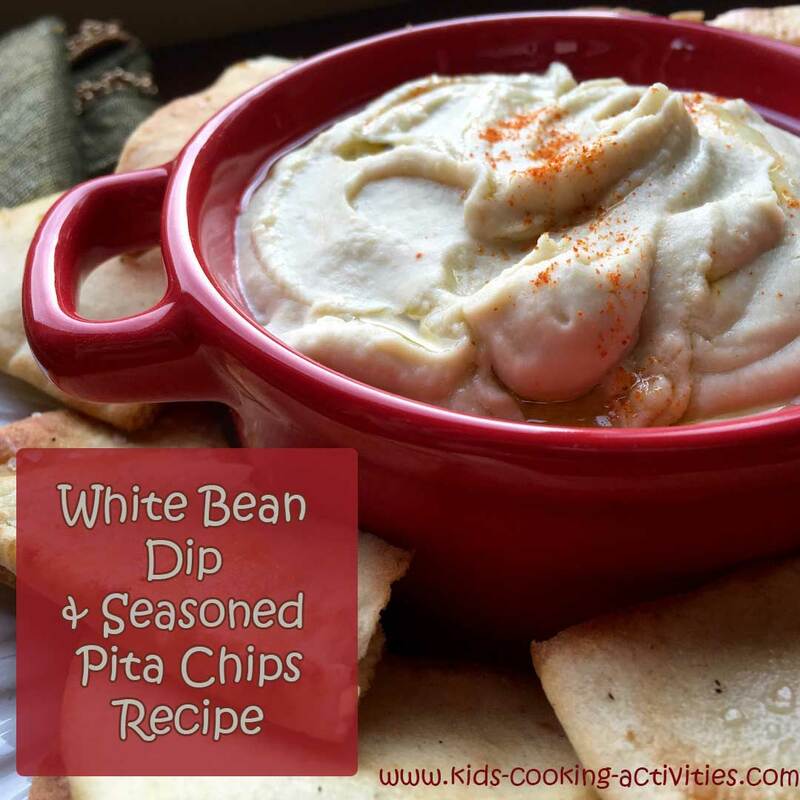 This delicious white bean dip is a great addition to any party menu. It is quick and easy to make – and your guests are sure to love the subtle balance of flavors packed into each bite. It is perfect with mildly seasoned pita chips or vegetable crudités. Tip: A little bit of fresh sage goes a long way. If you aren’t sure how much to use, start with a small amount. Then taste and add more, if desired. Although you can use the same extra virgin olive oil for the entire recipe, adding a drizzle of a higher quality variety right before serving will add an extra “pop” of flavor. Line a rimmed baking sheet with parchment paper. Cut each pita into 8 equal-sized wedges. Lightly brush pita wedges with olive oil on both sides and place on lined baking sheet. Season pita with salt and pepper before placing in oven. Bake for 5-6 minutes before turning each wedge. Return to oven and continue baking for another 5 or 6 minutes, or until pita wedges are golden brown. Remove from oven and set aside. Add cannellini beans, fresh garlic, lemon juice, sage leaves, and olive oil to the bowl of a food processor or blender and blend until smooth. Pour bean mixture into a serving bowl and season with salt and pepper to taste. Right before serving, add a dash of cayenne pepper and a drizzle of some high-quality extra virgin olive oil. Serve with seasoned pita chips or vegetable crudités. In a bowl, stir together hash browns, egg, oil and salt and pepper. Spray a muffin tin with cooking spray. Press hash brown mixture up along edges and create a nest shape. Bake at 400 degrees for 20 -25 minutes. Then fill it with boiled eggs. Or for a fun lunch idea, add egg salad, tuna salad or chicken salad inside the nest. Here is another potato nest recipe here. 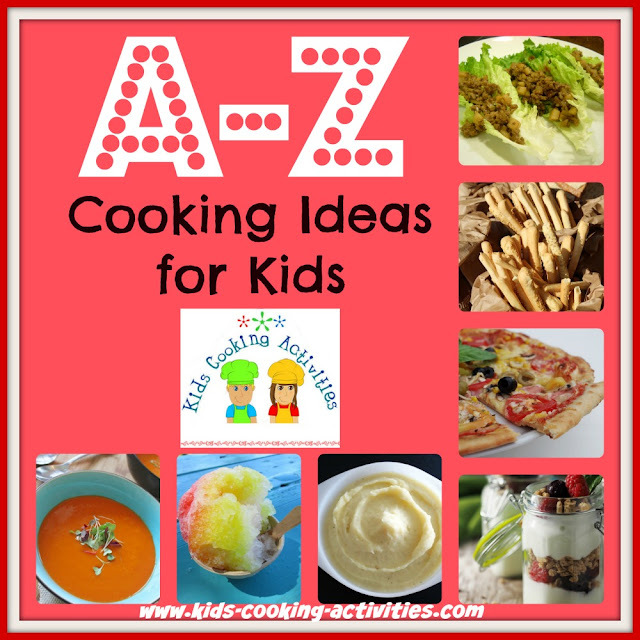 Do you need a fun way to introduce the alphabet and cooking to kids? A theme idea like cooking with the alphabet can teach kids not only their letters but help them learn some fun cooking techniques too. This could be a fun activity to incorporate into your school year. How about Alphabet Cooking Friday? Where you concentrate on a letter of the week and end the week with some cooking activities inspired by that letter. We can come up with a lot of fun letter activities but here we will concentrate on A-Z cooking recipes. Letter A Cooking IdeasApple recipes are a kid friendly hit or try Alfredo for dinner. You'll be surprised at how quick you can whip up some Alfredo sauce to go with your cooked noodles or broccoli. Letter B Cooking Ideas The letter B has a wealth of great recipes for kids like Broccoli, Beans or Basil Pesto . However you can go for meals like Bubble Pizza or Homemade Bowtie Pasta as well. Anytime you can create something fun with your food kids will eat it up. Try giving the kids ideas or a picture and let them make their own creations. 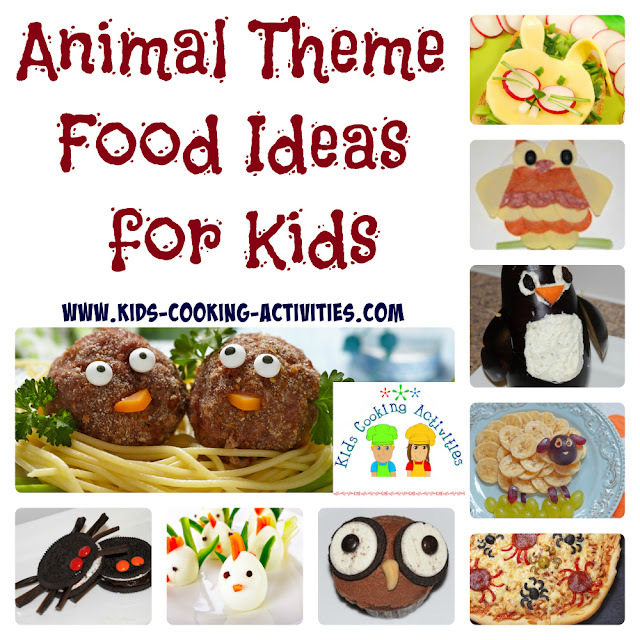 Here are some of our favorite animal theme food ideas. Animal Theme Food Ideas Turn a simple boiled egg into chicks. See a few variations on our farm theme page. You can buy candy eyeballs and use them all over your food just like in these meatballs. Just add a carrot piece for a beak. Dinosaur Ideas- Create dinosaurs out of vegetables makes a fun twist in a vegetable tray. Snake theme ideas can be easy as this simple tomato mozzarella "salad" snack or see more snake theme ideas here. Bird Theme Snacks: These are easy to make with a few ingredients. 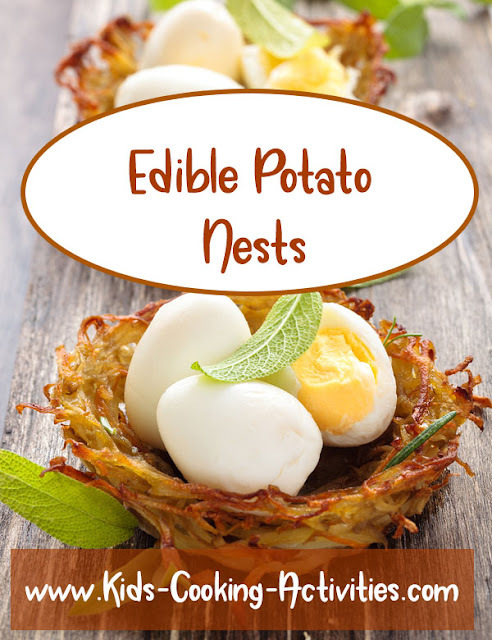 Also try edible bird nests. Penguins- Create fun penguin theme snacks. Learning how to make frozen yogurt is becoming more and more popular as people search to find a healthier alternative to ice cream and at the same time want to satisfy their sweet tooth. Also, frozen yogurt is much better for kids to munch on during the hot days of summer. Making frozen yogurt is such an easy thing to do and it’s one of my favorite to do items during the summertime. I will make frozen yogurt pops for my kids and they love sitting out in the back yard under the shade of the tree licking their pops. Usually they end up in a big mess with yogurt dripping off their faces but they are pretty cute eating their treats! 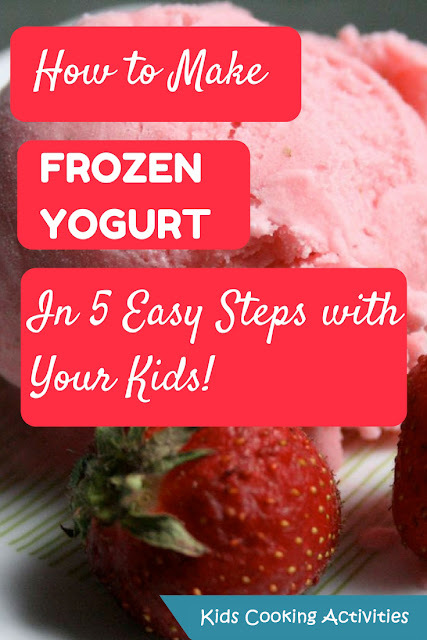 So, this post is going to help you get to making frozen yogurt and you can also have your kids make it on their own using the yogurt from the stores. What better way to celebrate Earth Day on April 22 then by planting something and making dirt cups! 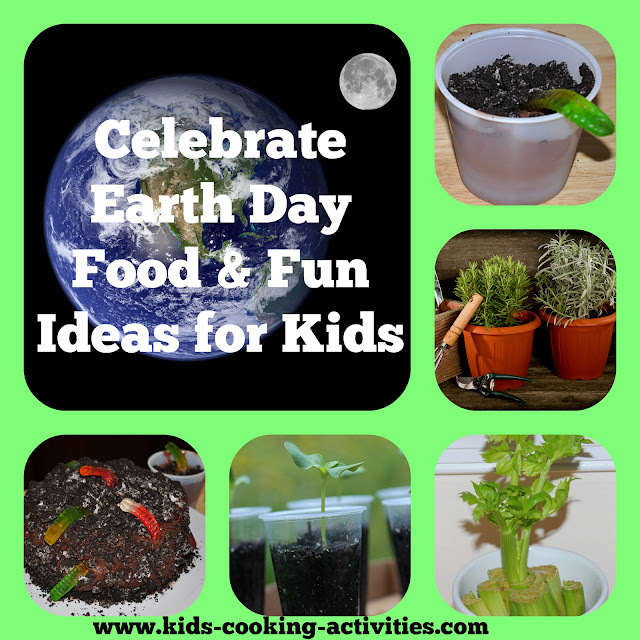 Growing Projects for Earth Day First here are some ideas to plant on this Earth Day. Of course planting a tree is a great activity, but if you don't have the space here are some smaller space ideas for planting. 1. Plant seeds in egg cartons or reuse plastic cups. 2. Regrow your vegetable scraps into new plants for your garden. 3. Plant an herb garden. 4. Plant grass in a crafty box. Create a cardboard box out of recycled cardboard or cereal boxes. Decorate, color and design the outside how you'd like. Line the bottom with heavy plastic sheeting. Add potting soil. Press seeds into soil. Radish seeds grow quickly or to look like straight hair plant grass seeds. Using a spray bottle, spray seeds slightly with water and cover with plastic wrap for several days. Uncover and spray every day. 1 to 2 weeks later you will have a basket that has real looking grass in it.